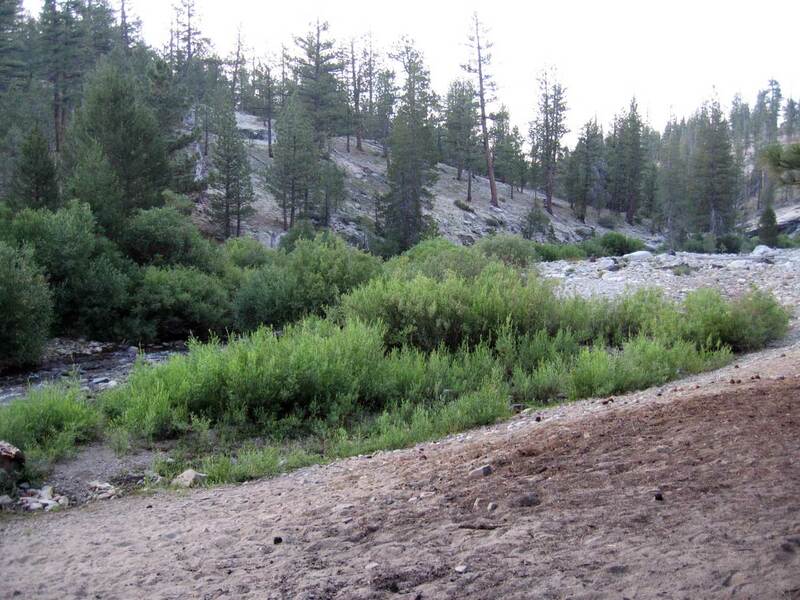 Although there are several ways of getting to the Little Kern River, such as the Forks of the Kern Trail, this trek goes through a well shaded area of the Golden Trout Wilderness. Views of meadows, Clicks Creek, and various conifers are seen on this route. Wildlife tracks and sightings are more common compared to other trails. However, there are two trailheads to choose from. Trailhead #1 is the most common and directions are pretty straight forward to get to. Livestock tend to go in this way because of the larger parking area. However, it adds about 1.2 miles of additional hiking (one way). Trailhead #2 takes a little bit more navigating on Forest Service roads, but you will shave off about 1.2 miles of hiking. There are hitches for horses, but the parking is not as big as the other trailhead. This trip can also make a good overnight fishing or camping trip as it is only 3.8 miles one way. Take Highway 190 to the top of the mountains near Ponderosa. Take a left at the wooden Golden Trout Wilderness Pack Station sign and follow Forest Service Road 21S50. In about 4.5 miles you will arrive at a road junction. The pavement ends and two dirt roads begin. Make a left towards Clicks Creek Trail as this is still road 21S50. Drive a few more miles and you will arrive at the Clicks Creek Trailhead #1. The trailhead is on your right by a wooden kiosk and parking is on your left. Typically port-a-potties are there in the parking area, but not guaranteed. The first mile of the trail treks downhill and crosses Clicks Creek. The trail continues along the western edge of the meadow. Enjoy wildflowers and nice views in this stretch. The trail crosses over and somewhat contours the hillside to the east. You’ll soon arrive at the Golden Trout Wilderness boundary marker and continue past where the second Clicks Creek Trailhead enters from your right (south) just before the large down tree. Continue to trek downhill for 2.2 miles to a junction. Enjoy the seeing meadows, a shaded trail, and then crossing Clicks Creek. The trail junction is not far once crossing Clicks Creek. Take a left for another 0.9 miles. The area is dryer and the canopy cover is less. The trial becomes more sandy in this section of the trip. Proceed straight at the next trail junction and do the same 0.3 miles later. Now continue another 0.4 miles to the Little Kern River. There is a collection of conifers people disperse camp under if you decide to make this an over night trip. Otherwise enjoy the river and head back the way you came. Take Highway 190 to the top of the mountains near Ponderosa. Take a left at the Golden Trout Wilderness Pack Station sign and follow Forest Service Road 21S50. Leave 21S50 by going straight onto Forest Service Road 20S79 towards the Pack Station. After about 2 miles the road has a junction. Proceed straight ahead onto road 20S53 and no longer follow signs to the Pack Station. At the next junction take a left (west on 20S53), and the next another left (west southwest on 20S64), and finally take a right at the third junction (north on 20S64B). You should see a couple grey signs stating “Clicks Trailhead” for the previous two junctions. The road ends in a small loop with a horse railing in the center. The trailhead begins on the northern side. The trail makes a short climb from the parking lot and then heads downhill. Within about 5 minutes or so, the trail intersects the Golden Trout Wilderness boundary. Continue to trek downhill for 2.2 miles to a junction. Enjoy the seeing meadows, a shaded trail, and then crossing Clicks Creek. The trail junction is not far once crossing Clicks Creek. Take a left for another 0.9 miles. The area is dryer and the canopy cover is less. The trial becomes more sandy in this section of the trip. Proceed straight at the next trail junction and do the same 0.3 miles later. Now continue another 0.4 miles to the Little Kern River. There is a collection of conifers people disperse camp under if you decide to make this an over night trip. Otherwise enjoy the river and head back the way you came.